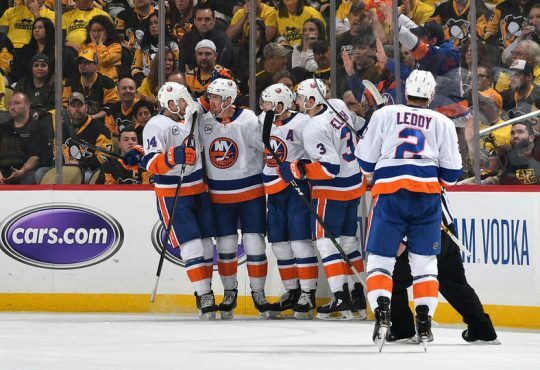 As the New York Islanders get set to open up its first-round series against the Pittsburgh Penguins Wednesday night at Nassau Coliseum, it’s hard not to reflect on the road they took to get to this point. Earning 103 points and a second place finish in the Metropolitan Division is one hell of an accomplishment, one that no one could have foreseen back in September. But from the beginning of the season until game 82, there were a number of games that changed the perception surrounding the team and solidified that they were not just a good team, but a great team. Our Rob Taub examined the landscape of the season and came up with these five. It goes against the grain to name a loss as a game that made you take a second look at this Islander squad, but that’s exactly what this early season tilt did. The Isles were coming off a brutal 4-3 shootout defeat to the Canadiens in which they had squandered a 2-0 and 3-1 lead just a few days earlier. The Bolts were just a few weeks in of what would evolve into a dominant and history-making season. The Islanders skated stride for stride with the league’s best Lightning. They were the better club the majority of the game and nearly won it in the third. One mistake late in regulation on a defensive zone faceoff cost them at least a point. The game was way closer than the 4-2 score indicated. Going back and examining that game, it was one of those affairs early on that proved the Isles can play with the anybody, including the top teams in the sport. A lot of people had this game circled on the calendar from the start of the year for one juicy reason: It would be the first time the Isles would face off against former captain John Tavares and his new club. For the guys in the Islanders room though, it was just another game and a chance to make it back-to-back wins after beating Ottawa 6-3 24 hours earlier. Enter Mathew Barzal stage right. Barzal put on a show for the ages in front of a nationally televised audience on Hockey Night in Canada. He recorded a hat trick in a 4-0 drubbing of the Leafs. 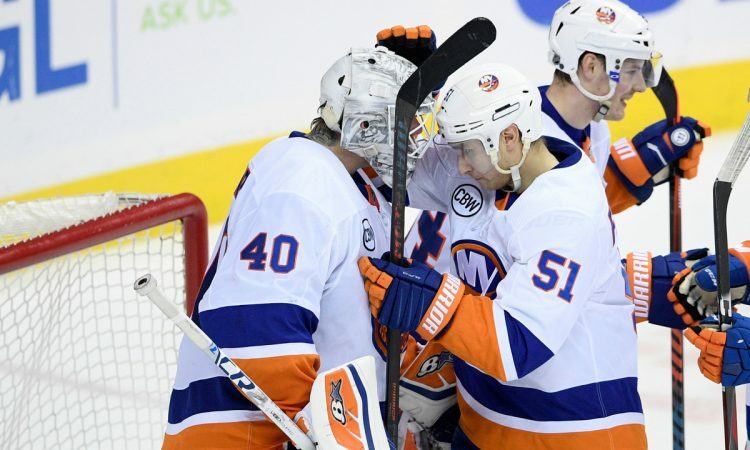 Beyond Barzal’s magnificent performance, the Islanders put on a defensive clinic, containing one of the best offensive teams in the National Hockey League. There were contributions from everyone on the roster and they played almost a flawless team game. Barry Trotz had his troops ready to play, and man did they make a statement. That victory resonated throughout the organization from the players on down to the fans. And it did one more crucial thing, it made the rest of the league stand up and take notice that the Islanders were to be respected. Some might question this game as a choice, but it stands out in a few important facets. Simply put, the Islanders were not facing the same Blues club that went on a scorching second-half run and secured a playoff spot. At the time of this showdown, St. Louis was sitting in the basement of the Western Conference and looked like a lost cause. Going down 2-0 to a brutal Blues squad early, this one looked like games of years past when the Islanders would play down to their competition, no showing and giving away two points. But even when good teams are not playing to the level they’re capable of, the ol’ saying goes, “You find a way to win”. Somehow that’s what the Isles did and in the most opportune fashion. Matt Martin got them within one on just their second of only two shots in the second frame. In the third, the Isles scored three goals on six shots to steal a 4-3 win. Many were scratching their head how the Isles pulled off such larceny, even Trotz. He even said in the postgame that they should get back on the plane wearing ski masks. But that effort spoke to the Islanders resilience they showed all season long and that they never seem to be out of a game. Besides the final game below, this night was a culmination of how far the Islanders had come as a team in such a short period of time. Yes, it was the second night of a back-to-back — the Isles dominating the New Jersey Devils the night before — and yes it was head coach Barry Trotz’ first game back in D.C. since he left the Caps after leading them to its first Stanley Cup in franchise history, but something loomed larger from the outcome that night, first place in the Metropolitan Division. This was a tight defensive game, one that became what the Islanders were known for with their improved structure. But the Isles also did good things offensively and hit paydirt after capitalizing on the Capitals mistakes. Holding the high-powered Capitals to 19 shots was also quite the eye-opener; shutting them out just added another feather in the cap of the players. What this victory signaled was the Islanders were going to be serious players in the division for the rest of the season. Probably the most exhilarating game of this season — post the beatdown of John Tavares and the Leafs in front of raucous Coliseum crowd just a month earlier — is how to describe this victory. 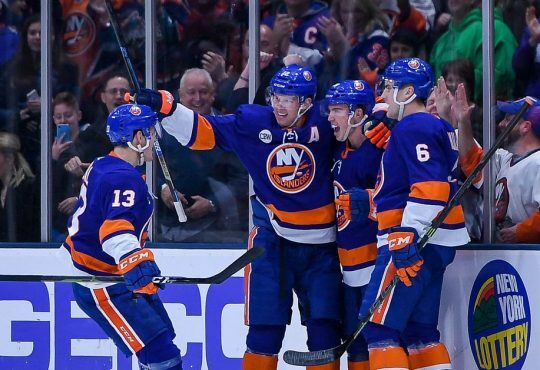 Against one of the top outfits in the West, in a building that is extremely hard to come away with two points and playoffs within reach, the Islanders dug down deep and found a way. The way the night started for the Isles couldn’t have been any worse. Down 2-0 just 6:11 in, it seemed like the game was going to be a repeat of two prior games that past week (the 4-0 loss to Columbus and 4-0 loss in Montreal). 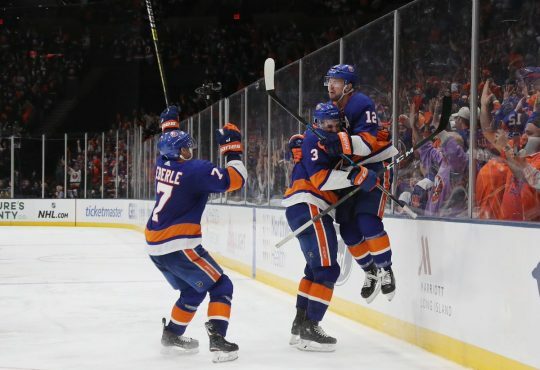 But then Eberle found Barzal who scored for the first time in 19 games and it was a game again and everything seemed to settle down for the Islanders after Barzy’s tally. Early in the second and two broken sticks on one shift, the team caught some bad luck and was again in a two-goal hole. Again, the captain Anders Lee got them within one surprisingly on the power play and the ice was tilting. Even with a number of chances to get the game tied, the Isles couldn’t get the equalizer, eventually giving up a power play goal and going back down 4-2. Then the unthinkable occurred, the Isles kept coming. Barry Trotz’ crew had fought back from goal deficits all season and come away victorious, but how they did it on this night was out of character. Jordan Eberle — who arguably played his best gam of the season on this night — made it a one-goal game with just under 13 minutes left. The Isles turned up the heat after that and were finally rewarded late in regulation. Casey Cizikas, scoring his 20th of the year, tied the game. 33 seconds later, Eberle, after a monster rush by Barzal, potted one home to give the Isles a 5-4 victory that put them one victory away from the playoffs. Without question, this win was the defining moment of the Islanders season. Having to fight back from two-goal deficits three separate times in the game and win in regulation, the Isles showed a ton of heart and determination. It was a remarkable effort and put the exclamation point that this is a team not to be taken lightly in the postseason. Lou Lamoriello has had the same answer all year long when asked to discuss if he saw the success his team achieved this year. And he’s 100 percent right. Nobody had an idea of how the Islanders season was going to unfold. Many had their predictions — I’m sure you all know the names and the outlets by now — and they had every right to have those perceptions. Losing John Tavares was a shot to the solar plexus of the organization from top to bottom; having also lost d-man Calvin de Haan to free agency and coming off the worst statistical season defensively for an NHL team in over a decade didn’t make things look any prettier. Nobody could blame the fans if they believed this was going to be another lost season. But then you insert Barry Trotz, 20+years of experience behind the bench and a Stanley Cup winner; Add in a few good, hard-working veterans, Leo Komarov and Valtteri Filppula; Bring in two players with a chip on their shoulder, Matt Martin and Robin Lehner; Things began to look not so dim. Then came winning, and how so you might ask? Those were the three words the Islanders lived by and they stand with 103 points and home ice for it. This year for the Islanders was about proving people wrong and they’ve done it with defiance and gusto. The accolades speak for themselves. A top five finish in the NHL; Worst to first in goals allowed; 11 shutouts combined for Lehner and Thomas Greiss; Brock Nelson scoring 50 points for the first time in his career. This organization was given no chance to succeed merely nine months ago. They took that to heart; now they and are in a better place for the present and future then they’ve been in nearly two-plus decades. This season is a surefire win for ownership, front office, the players and the fans. Making the postseason wasn’t even a thought when this team first came together for training camp in September. But they bought in and here we are. And even if they do get bounced in the first round, this season will be a building block that can get the franchise to where they hope to be in the near future. Then again, this team earning its first postseason berth in three seasons also signals that whatever they do from this point on is gravy. Let us not forget the magical carpet ride the Vegas Golden Knights went on in the postseason last spring. It was an unprecedented and the best story in hockey. A run to the Cup does seem like more a dream than reality for this current Isles team, but the postseason can be as unpredictable as ever. The Islanders going on a run would do wonders with the fanbase and repay them for all the trials and tribulations they’ve had to endure since the early 1990s. Lord knows, they’ve earned it. All the chips are on the table now. Now the question is which hand will the Isles play? You don’t need my preview or predictions of the series, there’s already enough to go around. But, if the Islanders are likely to defeat the Penguins, they’ll do it these three ways. 1. The power play. We’ve watched how dastardly the power play is this season and how any way to improve it has failed miserably. But, if ever a time for the Islanders to finally get it right, it’s this series. 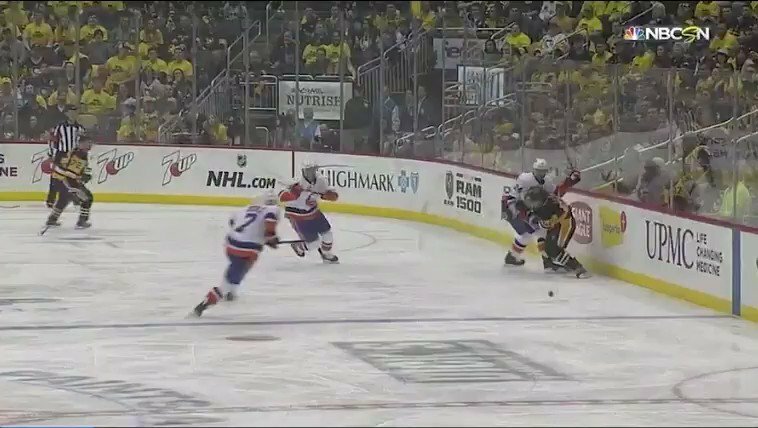 Pittsburgh’s penalty kill is nothing to fear and the Isles have enough skill to make them pay. 2. 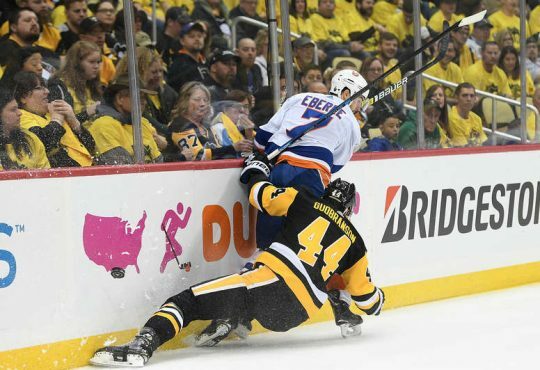 Exposing the Pens D. The big names still remain — Letang, Maatta, Dumoulin — but how the Isles are going to take advantage in this matchup is by taking it to the Pittsburgh’s inexperienced-men. 3. Home ice advantage. The Islanders fought tooth and nail to secure home ice and now they have it. They need to feed off that explosion of energy that the Coliseum crowd is going to bring. And if they get that seventh game, well, you know the rest.